Strong cold front moving through the U.S this weekend (noted on the satellite, colors of blue and white/cold cloud tops). 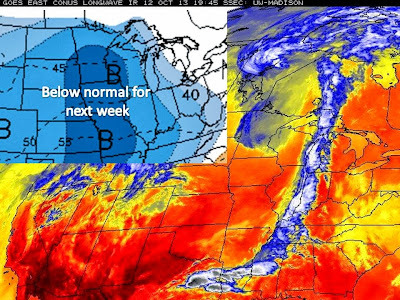 The strong cold front will usher in much cooler air for next week and beyond. A major pattern change compared to what it has been. Below normal high temperatures will take hold of the whole midsection of the country by the start of the week. A couple snow flakes are also possible in the Dakotas by the middle of next week and a strong area of low pressure passes through the area. Rain showers will persist to the east of the system.